Last month, the US Navy and General Dynamics took the lid off the new U.S.S. 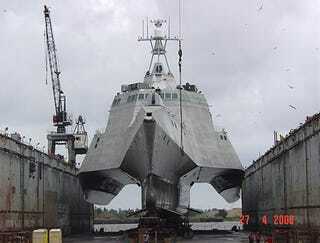 Independence littoral combat ship (LCS). This beast will sail close to the shore and throw everything imaginable at an enemy—from armored vehicles and helicopters to shells, torpedoes and missiles. Plus, it can hustle at a rumored 60 knots. Basically, that means the enemy will have a difficult time escaping the wrath of this mighty vessel no matter where they are.